Our collection includes 12 beautiful stones that we have sourced available in numerous finishes these include; Original Colonial and of course Vintage. Our experience in sourcing some of the most beautiful natural stone on Earth, enables us to offer what we consider to be the very best of stone flooring, coupled with our passion makes selecting the right stone for your project an enjoyable experience. In our showrooms – Let us guide you through our board of education to explain the processes and the journey your stone will take before becoming a vital part of your project. Our collection represents stone that we know will appeal to a wide variety of tastes, chosen because it will enhance any environment from the very modern, contemporary to the most traditional. A product that is by far and away the most popular and one that we are very proud to introduce is own very own range of Vintage Stone flooring. Designed to showcase both the untold elegance and the natural beauty of a Vintage stone floor. We have over the years worked on some beautiful projects; please take a look at our projects page to view some of these. All floors pictured have been installed by our own team of Installers. I have always meant to write and thank you for the fabulous stone floor that you laid for me at Upper Farm earlier this year. The floor looks absolutely wonderful and I am very delighted with it. 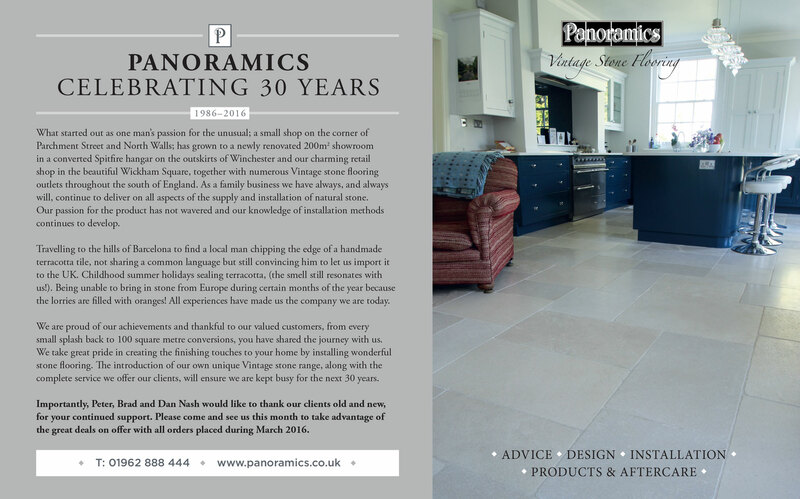 I have had many favourable comments on it and will always gladly recommend Panoramics for the quality of the stone, the constant professionalism of all I spoke to at Panoramics and the excellent customer service. It was nothing but a pleasure to plan the floor and purchase it with from you.